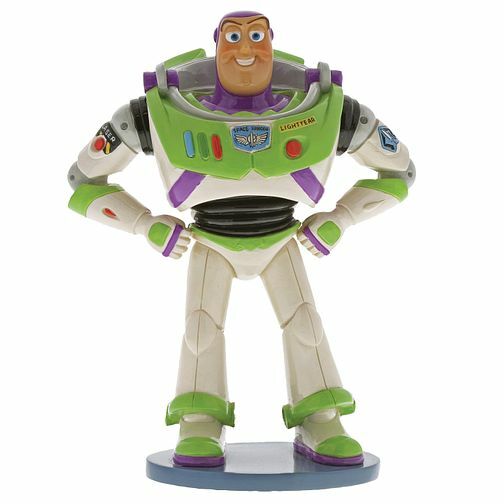 Drawing inspiration from one of the most iconic Disney movies of its time, this Buzz Lightyear figurine stands tall with his hands firmly on his hips. Made from hard-wearing resin, he has been hand-painted with a polished finish. Boxed up in a stylish gift box – he’ll make a fantastic surprise for that special someone. Note that the colours will vary from product to product. Intended for adults only. Disney Showcase Buzz Lightyear Figurine is rated 5.0 out of 5 by 2. Rated 5 out of 5 by Anonymous from Novel gift idea I bought this as a gift for my son, whom has now outgrown his former toy story toy but as it’s his child hood favorite I thought this figurine was a novel way to continue enjoying his childhood memories. Figurine is well made, smart and larger than expected. Very good quality for the money.